Bigger isn't always better. Like a bigger spider is no better then a smaller one, a bigger temper tantrum from your two year old, or a bigger cup of milk spilled during dinner. However, when it comes to photos on your wall, bigger is better. I had tears in my eyes when I pulled these from the boxes. I love them! 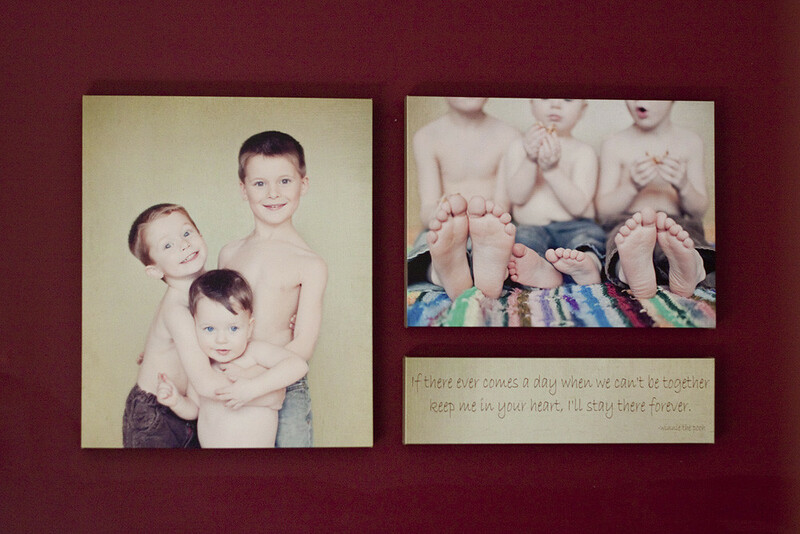 They are canvas on a 1-1/2" frame. These are 20x24, 16x22 and 6x22. They fit well in the space they are in, but if I was going to put them over a couch I would have printed them bigger or added more prints to the grouping. Yes, I know canvas prints are an investment. But I can guarantee once you have them you won't regret the purchase one single bit. I will walk past these probably 50 times a day and smile each and every time I look at them. If you're considering canvas, I invite you to come over and check these out for yourself. A picture in my dark office, against my needs to be painted red wall does not do them justice.